Looking for a pack that’s one-of-a-kind and sticks out amongst the crowd? 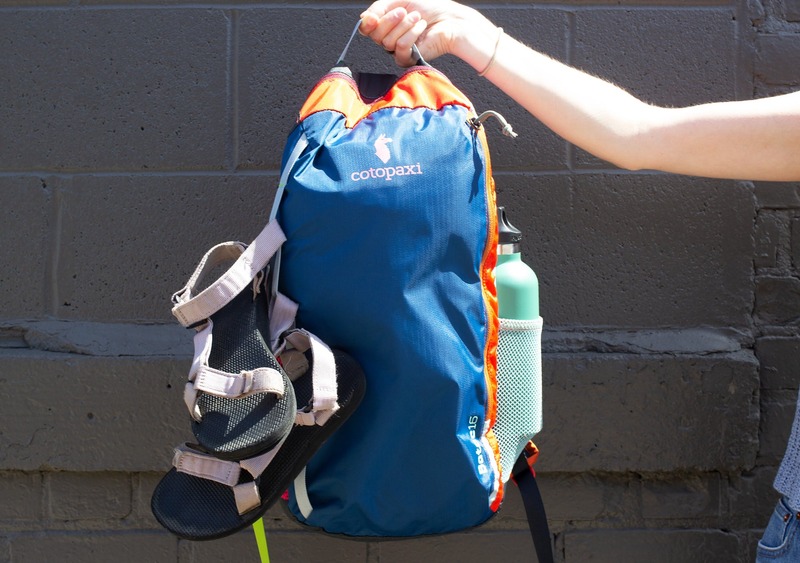 The Cotopaxi Batac 16L functions as a daypack while showing off some unique character. The Cotopaxi Batac is a colorful and unique daypack that is bound to stand out amongst the crowd. 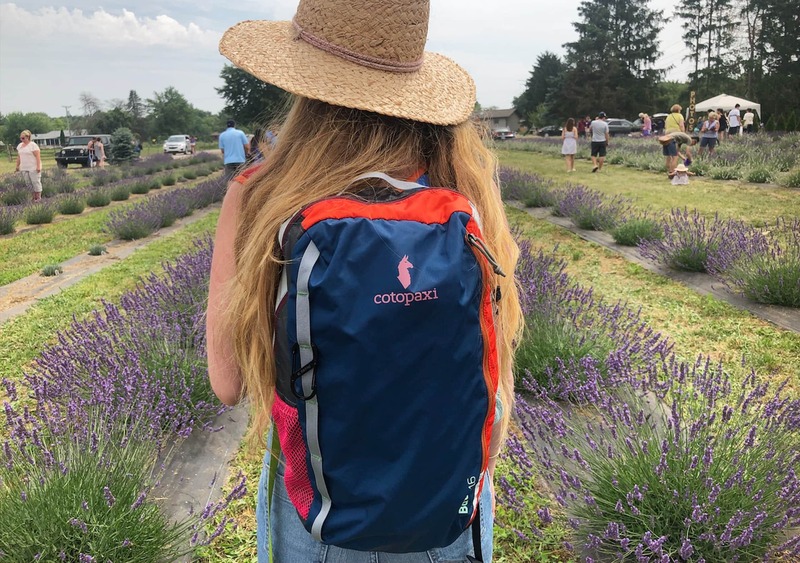 This pack is part of Cotopaxi’s Del Día collection—a line of backpacks, totes, duffels and other bags that are individually customized by Cotopaxi employees. Every single design is one-of-a-kind, blending the skill and creativity of each individual worker. 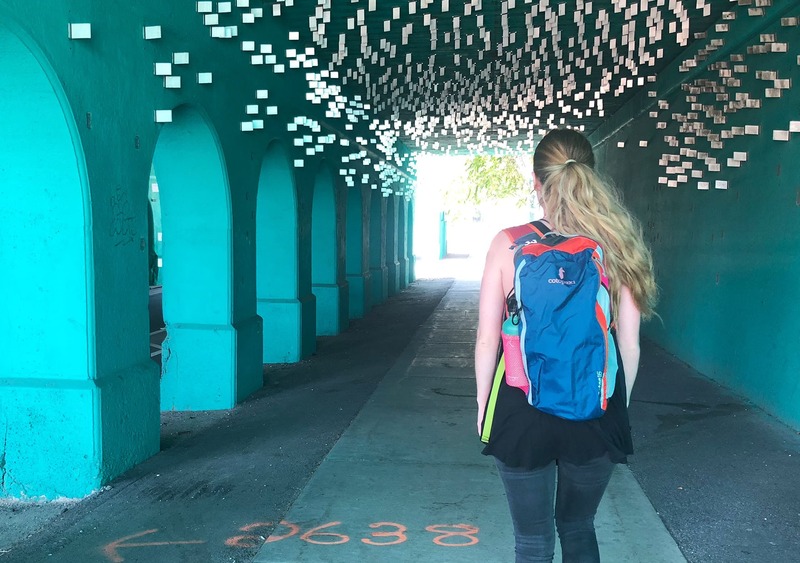 Yes, you read that correctly—the color and overall look of your pack is entirely in the hands of a Cotopaxi employee in the Philippines. These bags also help to reduce Cotopaxi’s waste by utilizing scrap fabric—and for that, this pack initially appears to be a win-win. With only a couple gripes so far, let’s dive into the full breakdown. The Batac comes in one-of-a-kind color patterns, as each is uniquely made with hand-picked scrap fabric by Cotopaxi workers in the Philippines—meaning whatever shows up at your doorstep will be a complete surprise. If you’ve looked at Cotopaxi’s products before, you probably noticed their vibrant color schemes—you can expect something with a pop of color with this specific pack. So, to be clear, if you’re into more neutral packs this one may not be for you. 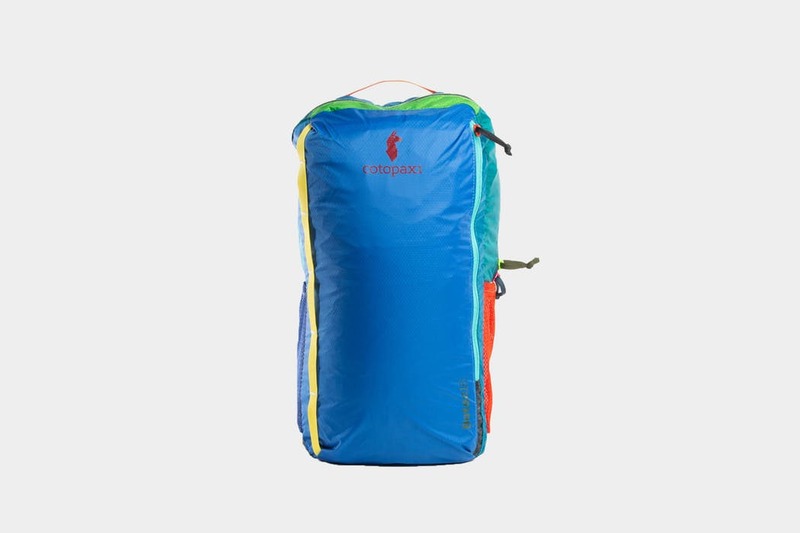 However, if you do feel like changing things up from your usual neutral pack choice and you’re not completely satisfied with the pop of color the Batac has to offer, Cotopaxi has a fair return policy accepting returns on orders shipped within the US within 90 days of purchase (just note that your pack must be unworn, unwashed, and undamaged). A Cotopaxi representative also confirmed with us that they are open to hearing the customers perspective regarding color requests if you’re looking to exchange the pack. Aside from the unique color scheme of every pack, Cotopaxi stays consistent with their subtle branding on the front and side of the pack—including the Cotopaxi llama logo and pack name. Nothing too large to bother us, but worth noting. 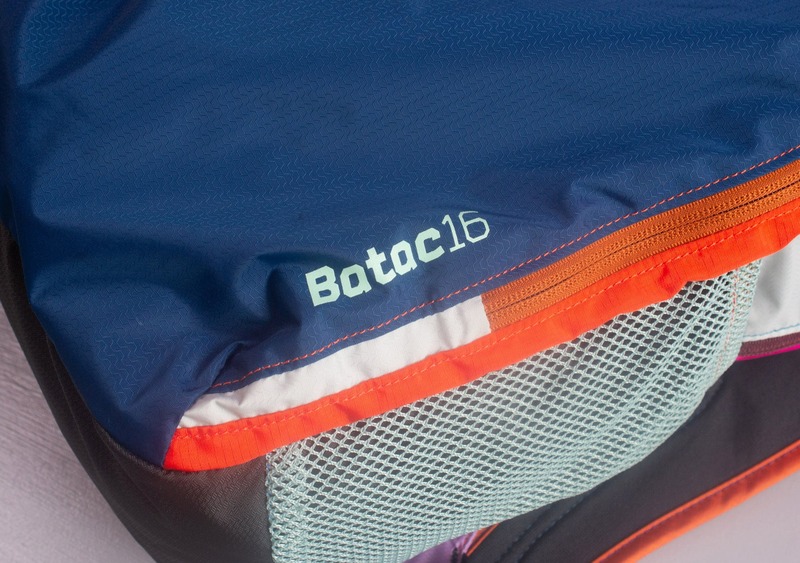 The Batac is made up of various pieces of repurposed ripstop nylon with multiple mesh compartments. Staying consistent with the utilization of scrap fabric, the shoulder straps are made of an ultralight mesh material that differs slightly from pack to pack. For example, one of our Batac’s shoulder straps is much more elastic than the other. 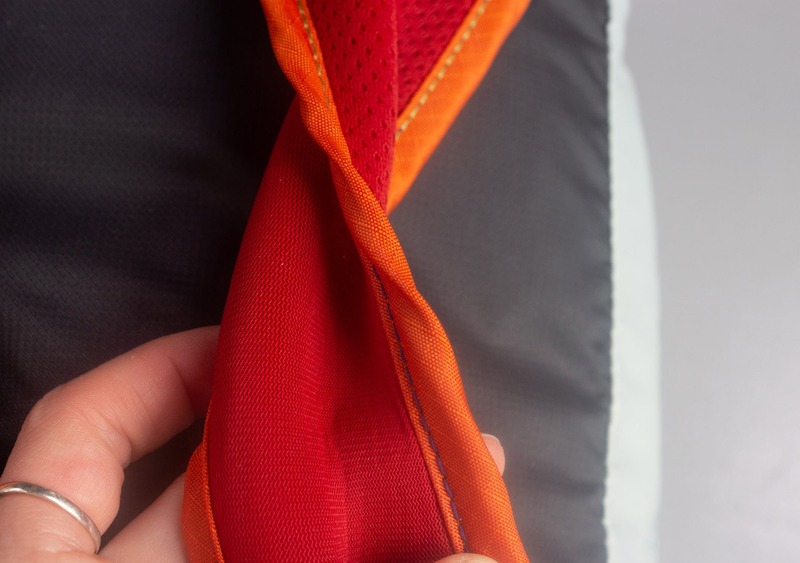 While the straps are comfortable due to their lightweight fabric, we have noticed that they can easily twist if you throw the pack on quickly—which can be annoying, but not a huge deal in the scheme of things. We also discovered that the straps work nicely in warm weather as the fabric is pretty breathable. Attached to the shoulder straps is an adjustable sternum strap made with Duraflex hardware. This thing isn’t technically attached to the pack but it’s a lot more secure than what we’ve seen on some other packs—we don’t really foresee it being an issue. There is a thin handle at the top of the bag for holding or hanging, with an additional loop on each side where you can clip a carabiner if needed. 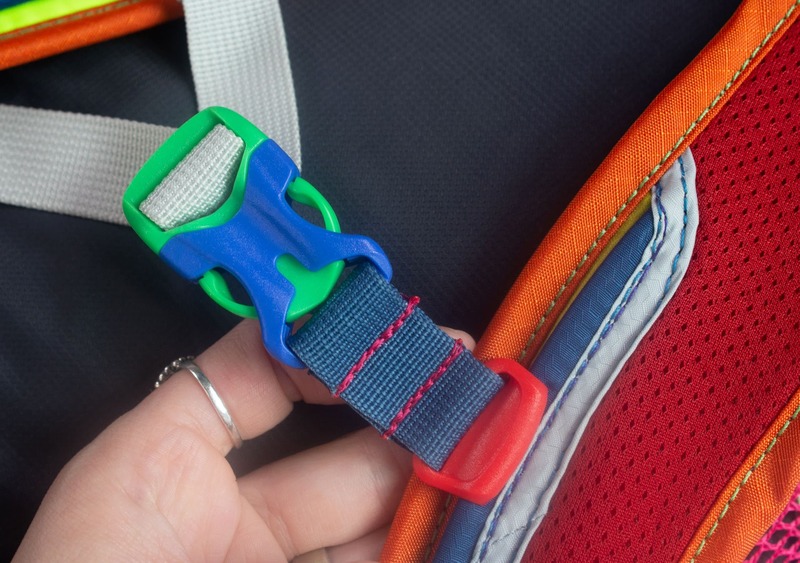 If those don’t get the job done, no big deal—there’s a strip of nylon webbing on the side of the pack where you can attach wet shoes or any other items for easy access. We strapped our Teva Sandals onto this while they dried out in the sun after a hike by the river. Two of the three mesh compartments can be found on both the left and right side of the pack. These pockets have probably been our biggest gripe thus far. When using a slightly larger water bottle—such as a Hydroflask or Nalgene—it’s a very tight squeeze. Not ideal. You’ll also want to be careful with these side pockets as we’ve found that just bending over can cause your water bottle to shoot out. Not cool if you are holding a glass water bottle. However, these can still be handy for quick access to smaller items like car keys, extra socks, or snacks. 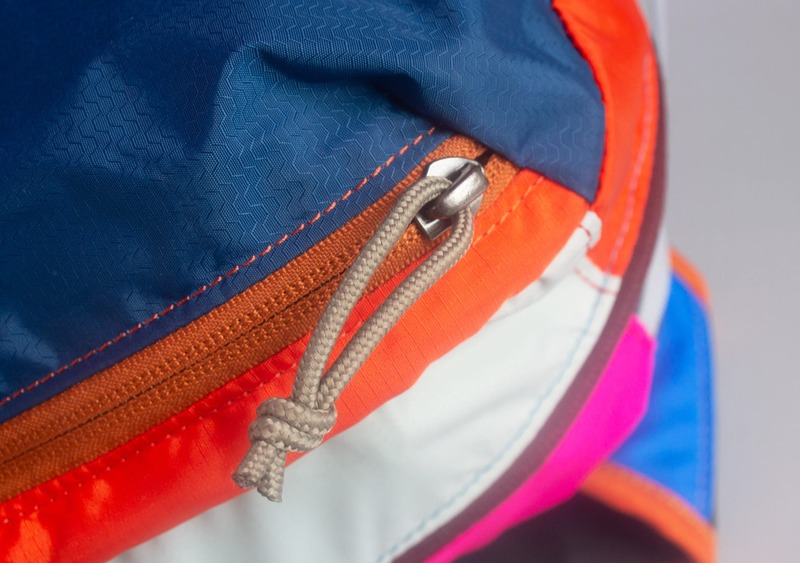 The main and front compartments are secured with YKK 8RC zippers—each with it’s own unique colored zipper pull. It’s also worth noting that this pack does not have some of the added features you might find in a larger travel bag—such as load-lifter straps, a hip belt or compression straps. But at the end of the day, we think it’s fine as it accomplishes what you would ultimately expect from a daypack. You shouldn’t need all the extra bells and whistles. Taking a look inside the pack, things are pretty simple. 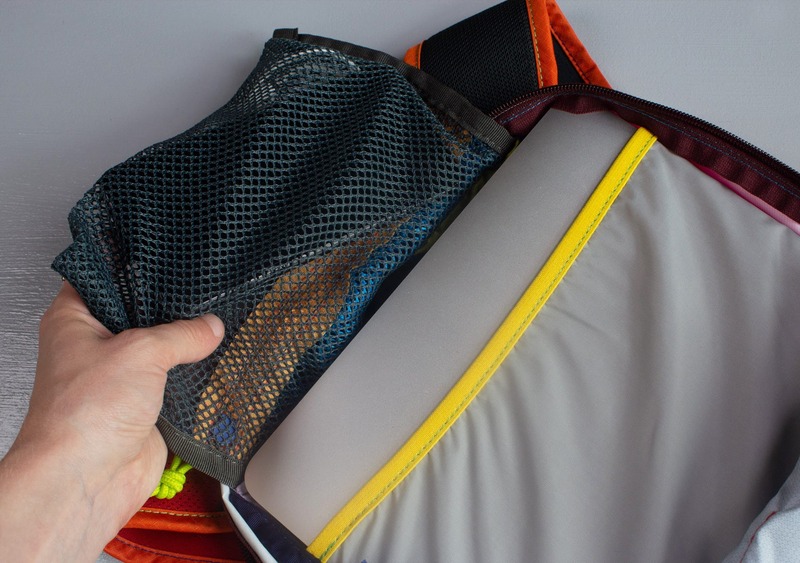 The main compartment has an internal hydration sleeve on the backside with a mesh pocket located near the top. The large hydration sleeve works great for a water bladder and can even fit a 15 inch Macbook Pro with no case (it is, however, a very tight fit). Score for the daring digital nomads out there! We did notice that the small mesh pocket at the top of the pack kind of covers the opening to the sleeve—which is pretty inconvenient and can make accessing it a hassle. 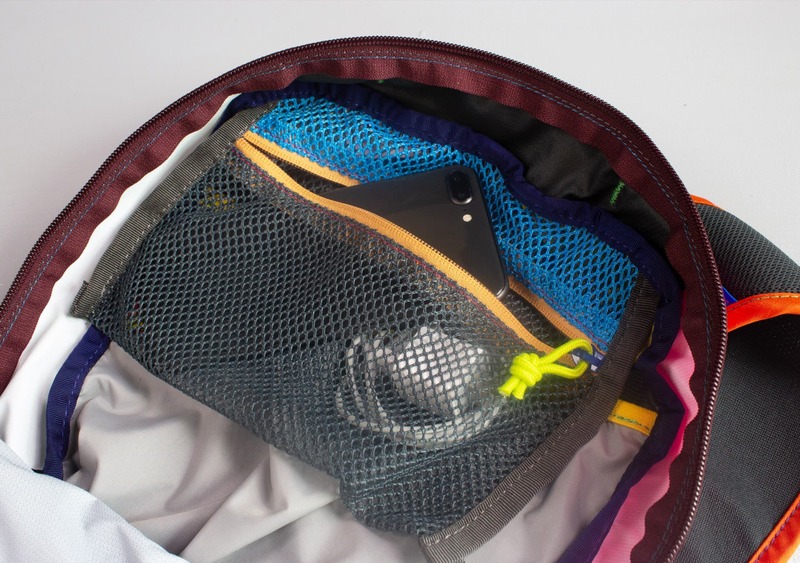 If possible, you’ll be better off storing smaller items in that mesh pocket. The front compartment can fit a decent amount, albeit with little organization. 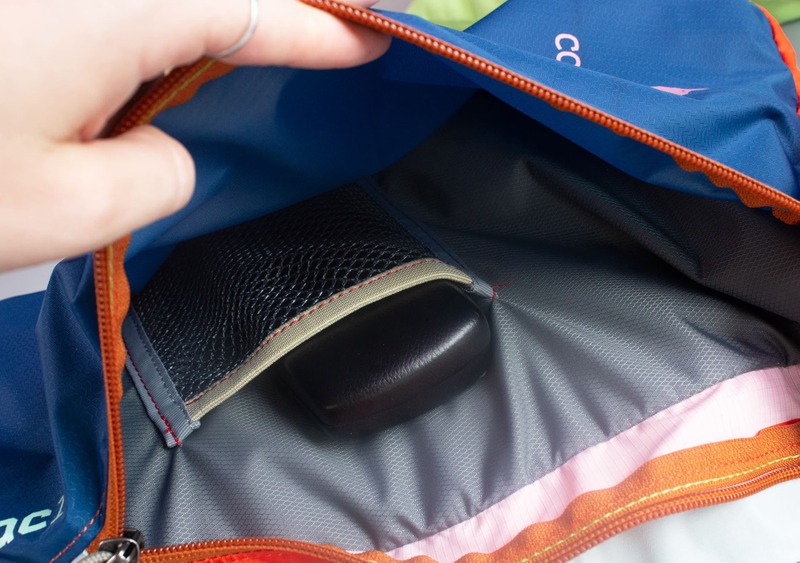 Within the front compartment, there is also one small mesh pocket located in the middle—which is kind of weird placement… However, you can swing the pack over one shoulder and easily reach in the front compartment, which is nice when you’re on the go! Overall, our experience with the Batac has been good so far. We’ve taken it on multiple weekend trips, across the border to Canada and have been consistently using it for a bit over two months at the time of this review. As much as we’ve been digging packable daypacks, we still love this pack despite it’s non-compacting capabilities. While we’re a bit concerned about the mesh side pockets and their ability to securely hold water bottles, the functionality and pop of personality easily make this bag stand out from the rest. Plus, we feel really good about supporting Cotopaxi and the employee who made our bag. We’re digging it. Looks great. Really digging the color scheme of our pack. We even got some compliments on it the first day! The mesh side pockets aren’t ideal and the interior small pocket have gotten in the way when accessing the larger pocket. But other than that, all looks good. 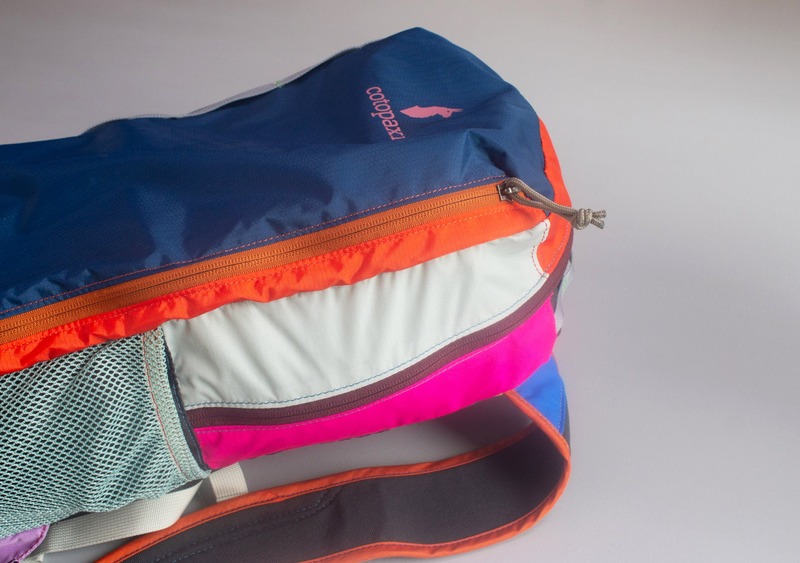 If you like surprises and a pop of color, you might want to consider grabbing the Cotopaxi Batac for your next trip. No pack is the same as another. Besides a few gripes about the side pockets and lack of packability, this bag has held up nicely during our testing and we think it will continue to do so for some time. Additionally, we love the Del Día mission this pack supports—we’ll give it an extra thumbs up for that.